The company behind the Pebble Watch is playing it cool when it comes to talk of Apple buying it out as a short-cut to an iWatch. Pebble's CEO Eric Migicovsky told CNBC that he couldn't comment on any speculation about whether or not Apple has approached the company as yet more rumours swirl around plans for an Apple watch. "I can't comment on anything like that, unfortunately," Migicovsky replied when asked about whether Apple had approached the company. That doesn't tell us anything per se - after all, it's usual for companies to keep talks confidential until an official announcement is made and it could be that not Apple but another company has come calling. 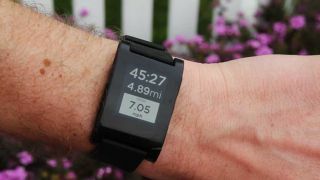 But it wouldn't surprise anyone to hear that major tech companies are sniffing around Pebble, whose smart watch is the most-funded Kickstarter project ever. The fledgling smart watch market could be blown wide open if Apple does launch a smart watch, something that seems ever-more-likely with news that the company has 100 product designers working on a "watch-like device". But Pebble doesn't seem too worried, more intrigued. "I think there's a lot of technological limitations right now, on putting the computational power and battery life specifically in a watch form factor," he explained. "I would be interested to see if anyone's been able to crack that code."